SBS premieres doco Expedition Volcano on Sunday, filming in lesser-known African volcanos, some of which are almost impossible to reach. 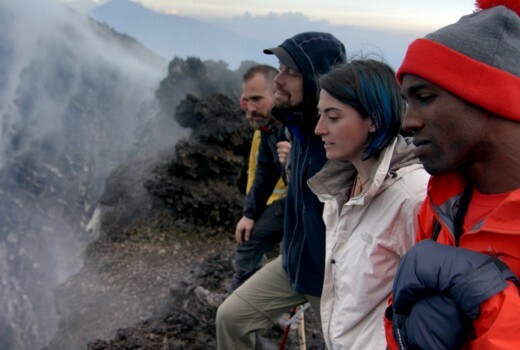 An extreme mission to the unexplored volcanoes of one of the world’s most dangerous areas. Can the team uncover secrets that could save countless lives? Towering above the hostile border between the Democratic Republic of Congo and Rwanda are the Virunga Mountains, home to some of the least explored volcanoes in the world. Continuous wars and devastating natural disasters have made these volcanoes impossible to reach. Now a team of brave scientists and mountaineers are on a mission to study one of the world’s most dangerous areas. The team pass lava-destroyed cities to reach the summit of the temperamental Nyiragongo volcano. Here they spend three days facing extreme temperatures and bubbling lava while living inside the crater, potentially answering geology’s biggest questions – what drives the movement of tectonic plates? Can the team find a way to predict when the volcano will erupt? They also visit Africa’s most active volcano, Nyamuragira. The team monitor the earth’s youngest lava lake and venture into toxic gas clouds that pour out of the volcanic area. Then there’s the deadly Lake Kivu, which has enough poisonous gases to endanger an entire city. This is an extraordinary expedition full of danger, but the information uncovered could save millions of lives and reveal some of the planet’s deepest secrets.